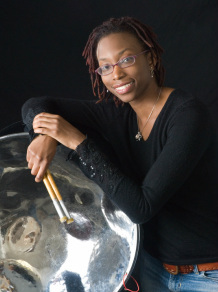 Malika Coletta has been performing on the steelpan for over 18 years and completed both a Bachelor and Master of music degrees at Northern Illinois University, where she studied with Liam Teague and Cliff Alexis. With the NIU steelband she had the opportunity to perform with calypso great David Rudder, perform at The Chicago Symphony Center, hold workshops, travel to Trinidad to perform with the TLC Skiffle Bunch steelband for panorama and founded the Mosaic duo, a collaboration of marimba and steelpan. During her tenure at NIU she co-directed the all-university steelband. She has written and premiered works for a variety of instruments and is a dedicated performer, arranger, educator and composer for the steelpan. From 2007 – 2011 she worked as Program Developer and Artistic Director for the Cultural Academy for Excellence, in Hyattsville, MD an organization founded by her mother Lorna Green. While there she also co-directed the world renowned Positive Vibrations Youth Steel Orchestra, and directed the award winning elementary band the Rhythm Runners. Malika currently works at Chicago Youth Symphony Orchestras as Education Coordinator.